Hello loyal readers! Here is the second edition of Not Me! Monday! 1. I was NOT feeling so crummy last week with mastitis that I let my kids eat cereal for dinner. And I certainly did NOT tell my four year old that as a reward for listening, she would get to fix dinner herself, then let her have free reign in the kitchen so I could stay on the couch, feeling like I was hit by a truck. 2. I also did NOT let my kids watch TV all day long without stop, in an attempt to keep them distracted so I did not have to entertain them. Nope, I am a much better parent than that, even when I am sick. 3. While fixing lunch today, I made soup and toasted bagels for the kids. I put the bagels under the broiler, thinking, "I cannot forget these and have them burn. Must remember the bagels!" I did NOT forget them to the extent that I smelled something burning, and instead of thinking, "the bagels!" I assumed there must have been some spilled food on the burner of the stove and stood there, staring at the stove and oven until smoke became visible. No way am I that sleep deprived and/or crazy. 5. Instead of buying cards for each other this Valentines day, we did NOT just go pick out the card we wanted to get the other and take a picture of the message with our camera-phones and put it back to save the $12 it costs now a days for two cards. That would be horribly pathetic and bordering on copyright fraud, or something like that. 6. While at Target yesterday, I did NOT feel the need to sneak up on Marty and bump him in the rear with the cart. I did NOT accidentally hit his heel instead, causing him to say that his rear must be getting smaller, since I missed the intended target. Emma did NOT look right at him and say "No it's not, Daddy," effectively deflating his ego and causing me to laugh so hard that people stopped and stared. And most importantly, I did NOT just blog about the incident, even though Marty followed me through Target, saying, "You're not going to blog about that one, right? Honey?" 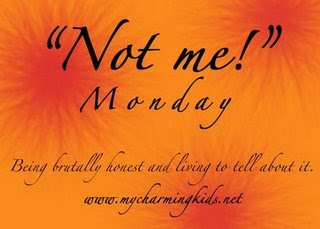 Don't forget to check out MckMama's blog for more Not Me! Monday! fun!